Texas Sodium Bentonite is committed to preserving and safeguarding your right to privacy online. 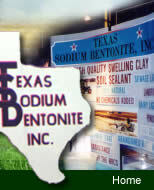 to contact us directly at info@texassodiumbentonite.com. 1. What information does Texas Sodium Bentonite gather when you visit? What information does Texas Sodium Bentonite gather when you visit? Texas Sodium Bentonite is committed to the security of information collected on our site. and Texas Sodium Bentonite has no responsibility or liability for these independent policies or actions. or your experience with this web site, please contact us at info@texassodiumbentonite.com.